A clutch of women entrepreneurs is making a mark with innovative business models. 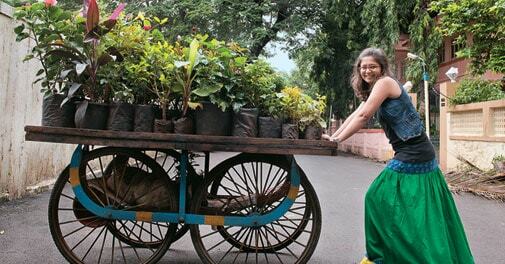 Priyanka Amar Shah, 27, believed that urban farming could take root in the concrete jungle of Mumbai. In 2011, Shah, nature lover and then a management student, decided to launch a venture to help individuals and companies grow consumable and non-consumable crops within their establishment. She pitched the idea in a concept show at her management college Welingkar Institute of Management. Shah received encouragement from peers and friends and decided to go ahead with her plans. iKheti was born with an initial seed capital of Rs 75,000 from her savings and contributions from friends and family. Today, she helps several households and companies go green. When Niyati Shah, 32, was expecting her first child in 2007, she knew that she would have to make a choice between her career and family. She loved her work at Yahoo! as the head of entertainment and knew that she had to keep working. So, together with friend and sales and distribution expert, Rachna Puri, she started Shotformats in Mumbai. Shotformats offers mobile and Internet consumer products and is currently focusing on its 'Biscoot' brand. It is a successful and a growing business now. The venture started with five people and currently the company has close to 500 people on its rolls. Indeed, while men are still more likely to be associated with novel ideas and concepts, there are several examples to illustrate that a growing number of women are making their presence felt. "There is a growing interest from investors to invest in teams with women entrepreneurs," says Ravi Kiran, investor and Co-founder of start-up accelerator VentureNursery, adding that the business proposition is what counts in the end. Consider, the example of two 28-year-olds, Tanvi Malik and Shivani Poddar. Childhood friends, they decided to launch an online fashion store - Faballey - catering to style conscious women like them, after they found branded apparel prohibitively expensive. "There were of course the likes of Zara and Mango, but they would drain our wallets in a month," says Malik. 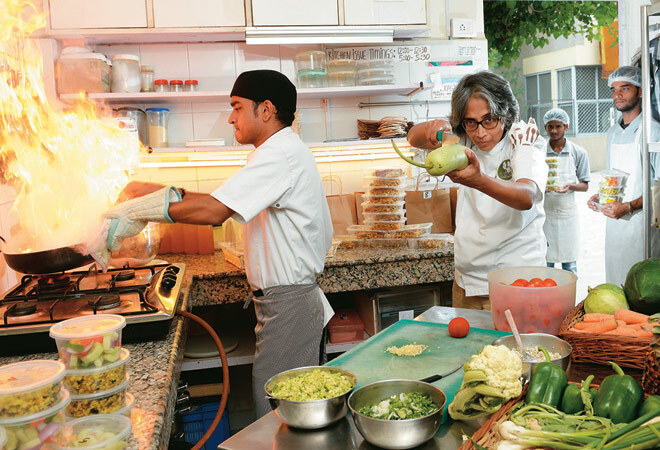 Serving it hot: Anuradha Madhusudhananâ€™s company Tattva runs a nutritionally prepared organic lunch service in South Delhi. The duo figured that they could offer affordable western style and fashion to women by working with local vendors and keeping a lean supply chain. The entire range of clothing was designed in-house and manufactured within a range of five to 10 kilometres from their Noida office. Malik and Poddar have overcome several obstacles along the way by tweaking the business model. When they started in 2012, they had only put up accessories on sale. "Our plan was to start clothing in a year, but we soon realised that accessories without clothes would not be accepted in India." Subsequently, they launched their in-house designer line of clothing within nine months of starting operations. They have competition from other brands that have jumped onto the ecommerce bandwagon but Malik asserts that they are better off. "We are our own customers," she says. VentureNursery's Kiran agrees. "Women understand other women. That insight gives them an edge in developing products that better meet the needs of women," he says. About 80 per cent of consumer spending is controlled by women and there is a big market for products and services developed for them, he adds. Similarly, Manjari Verma and Avani Patel, who run Broken Compass, a company that helps people plan trips, too have innovated to survive. Launched in 2009 in New Delhi, in the initial days of operations, the information shared with customers would often be passed on to other vendors who would then offer cheaper packages. But experience has made Verma and Patel smarter and more organised. "We now give broad suggestions till people confirm and only then do we give out major details," says Verma. "Now people know us and they come to us after word of mouth publicity." The company currently gets about 50 enquiries in the peak season and 15 to 20 during the off season. Anuradha Madhusudhanan, 43, is another women entrepreneur, who has evolved a unique business model. She was convinced that there was a market for nutritionally prepared organic lunch in Delhi, but wasn't too sure. But when her pilot lunch delivery service, which she started in June 2011, worked well, she launched her company "Tattva". She serviced some 10 customers daily in the first year. The number moved up to about 15 to 25 in the second year. She now has 30 to 50 regular customers whom she serves daily. Most of these women entrepreneurs have small but growing businesses. Shah of iKheti found it tough to win over prospective clients initially but has been able to generate profits recently. The duo from Faballey has big plans. The company, which currently serves about 600 orders daily, plans to expand its online presence to three more channels. The company currently sells through its own website and through other channels such as Flipkart, Jabong and Myntra. For Shotformats' Shah, her initiative Biscoot is shaping up well. Having touched 3,500 outlets, she plans to double the reach to 6,000 to 7,000 outlets by October. "We just had a huge gaming initiative. We bundled games and are selling it offline, which has taken off really well," she says. The company also received its first round of institutional funding last year from investment firm Matrix Partners India. Madhusudhanan, however, had to turn around the business after realising that she had expanded too much, too fast. Having started catering to multiple locations such as Delhi, Gurgaon and Noida, she realised there were logistical issues that would need some sorting out. So, she scaled down her area of operations to just south Delhi, worked on the supply chain, packaging and logistics, and is now starting to expand again. However, women are still seen as reluctant entrepreneurs despite some success stories. For instance, at the 10,000 Startup Program by National Association of Software and Services Companies that aims to enable 10,000 start-ups in India by 2023, about 5,000 to 6,000 projects are in the pipeline. Most of them are being run by men. "We feel that not more than five to six per cent of our applicants are women entrepreneurs," says Rajat Tandon, Senior Director of the initiative. Kiran of VentureNursery however says that, on average, 25 to 30 per cent of the applications they get are from women entrepreneurs or teams with women co-founders. More women then are likely to step up and be counted in the future.